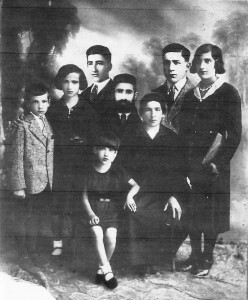 Mordercai Dov, Etel, and their six children. The three oldest siblings survived. In the back row from the left is Hershe (Carl’s Father), Joseph Meir (Nissim’s Father) and Hana. Only some of Carl Gross’s family were able to avoid annihilation at the hands of the Nazis. Before the war began, Carl’s family was living separately. His grandparents, Mordecai Dov and Etel, were living in a Lithuanian shtetl known as Abel. They resided in a modest, religious home with the three youngest of their six children. The older three had already left Lithuania to emigrate to the Americas. Carl’s father Harry, the second son, lived in Brooklyn, New York with his Uncle Joe and then moved to Freehold, New Jersey around 1938. Mordecai Dov, Carl’s grandfather, died in 1928 in a small hospital in Panevitz. He was there delivering hay when he fell off of his wagon and broke his neck. Having lost her husband, Etel was left alone in Lithuania with her three youngest children. In 1941, the slaughter began. Abel had a small Jewish community of over 600 people. With the help of non-Jewish townspeople, the Nazis rounded all of Abel’s Jews together. They were marched six kilometers to a hill in the woods where they were demanded to dig their own grave. Then were then forced to strip and all the Jews were shot and killed, including Etel and her three children. Thankfully, the two sons and one daughter in America were safe and could continue to remember the family and the tragedy in Abel. Carl’s father Harry married Ruth and had two children. Carl visited Abel five times over the years. His first trip was with his parents in 1980. Carl later returned with Rabbi Mayer Abramowitz for the dedication of the restoration of the cemetery. 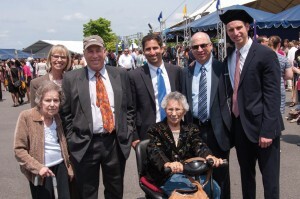 In the back row are, from left to right: Mary Gross (wife of Carl Gross), David Gross (son of Ruth Gross), Michael Prashad (son of David Gross), Carl Gross (son of Ruth Gross), Zachary Gross (son of Carl & Mary). In the front, from left to right: Helena Martone (mother of Mary Gross), seated on scooter – Ruth Gross (matriarch of the Gross family – mother of David and Carl). The occasion was the graduation of Zachary Gross from Suffolk Law School, May 2013. He again returned with his cousin Nissim Greisas, whose father had also survived, and another trip which included Carl’s brother David and Wife Marina. On his most recent trip about four years ago with his wife Mary and son Zac, they visited the Jewish cemetery. Carl was shocked by the state of disrepair at the memorial site and the desecration of the mass grave. Carl believes that the Holocaust and the slaughter of Jewish families like his own are bound to happen again. He says that intolerance for Jews will always exist and that we should be mindful of this. Through his experience, Carl has concluded that something like the Holocaust could definitely happen again and we must never forget.